Retreat from the bustle of the day and embrace quiet comfort and stillness. 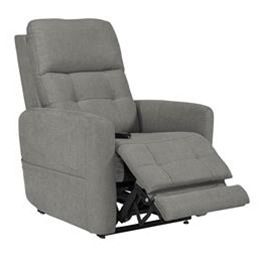 Make your home a true oasis with the Perfecta Collection from VivaLift!® Power Recliners. With one press of a button, the full-width power headrest delivers maximum support to your head, neck and shoulders. Smooth Merino fabrics and a button-back design offer a contemporary look. Seat To Floor Height 19"
Top of Back to Seat 25"